If you’re looking for flights from Newark Airport, Cathay Pacific is a top choice. With spacious seating, an excellent in-flight entertainment system and magazine, tasty food, and high standards of service, you’re sure to have a pleasant flight. Newark Liberty International Airport (EWR) is one of the major airports that serves the New York metropolitan area. A large airport, it has extensive facilities and amenities for travellers. You’ll find a large selection of shops, including duty-free stores, restaurants, and cafes, in addition to ATMs, currency exchange facilities, pay-to-use lounges, a spa, luggage storage, baby care rooms, and free Wi-Fi. There are three passenger terminals; Cathay Pacific flights depart from Terminal B.
Newark Airport is located 15 miles from Manhattan. There are extensive road and rail links: the free AirTrain connects the airport with Newark Liberty International Airport Station, and from here you can take the train to various destinations around New York, New Jersey, and beyond. The 24-hour Go Airlink is a convenient shared shuttle between the airport and the heart of New York City. Many public bus routes serve the airport and plenty of taxis are available. 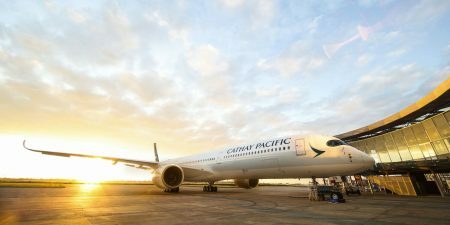 Book your Cathay Pacific flights from Newark Airport today.